As for Boyfriend....both SHK and PBG are my favourites for long time....but sorry i found it a bit draggy and boring... so might only watch later. Seriously. Kim yoo jung has transformed really well. I am so loving it. I am really wishing that she should be next park ji eun or kim eun sook actress. Please dramagods cast her with jjang scripts. She is ready to slayyyyyyyyyyyy. After long time waited for bo gum. Don't worry...... In 1-2 years when she is around 22-23.... i believe that she will be very popular with writers....it is just that she is still young...only 19 years international age and she has achieved so much... and many have noticed her talent. I believe it is just time. She is definitely going to give us many more successful dramas and movies that will definitely will hit milestones like Park Bogum is doing now. Cha tae hyun is really ❤️❤️. I agree with Lynnel, I found Boyfriend a little bit draggy too, but really nice filming, beautiful scenes in Cuba. BG and SHK voices are good though. I am gonna watch it later may be during weekend to support BG too. Anyway, I would like YJ and BG to act in a very good film next project and it hits Asia and Worldwide like Gongyoo did in Train to Busan, they are both ready for the lead role in movie. Just need a very good script, directer and production. But I prefer to watch YJ in movie first and wanna see BG attend her movie VIP. until now, I still really enjoy watching YJ faces in CWPFN, with long straight hair, pony hair etc she is really really pretty, prettier than when she was Raon may be just because she always wore 1 green costume unlike in CWPFN, she has worn many costumes, dress tracksuits, PJ, working suits etc. I wonder how BG feels when he watching this drama, he must be smiling and proud of her too. I hope to see Boyoo at award events when their dramas finish especially at Baeksang. Hope they both get acting awards they deserve. PS: I found YJ acting as a drunk person really cute, more realistic than BG, (just my opinion), she is a professional actor!!! i don't know if it is just me... but there are so many similarities between the dramas of Boyoo at the moment....it is just that CWPFN is a youthful one and the " Encounter" is the middle aged category. As for Yoojung's drama.... i am really rooting for some surprise increase in rating. It is really a nice drama that reflects the normal life of a young adult . ( I have watched it 3 times now eps 1-2 and it still makes me sad when yoojung says about the 97 pencils in the bucket) I hope that CWPFN will also have a high rating though it has less star power...the cable network is less known and the week day is also least popular. I think it is usually like this in any entertainment industry....the dramas or movies with big names and powerful acting usually draws in the crowds. Like suzy had in my love from another star?? Overall, I’m just thrilled to be able to see and hear BG and YJ on the screen again! Nice to kickstart convo in this forum again too. I am in tandem to what most of you are thinking. It’s awesome that BG is doing great and I’m happy that his drama is taking off with much love and support. However a little perplexed as to the sky high ratings. It’s definitely all due to having two sensational actors together and maybe a more popular network? Yes, we expected Encounter to do well, but to the point of knocking it out of the park?? After two episodes I’m still grappling with the main leads’ chemistry. The writers haven’t sold me yet on how these very different characters can fall deep for each other-it seems like it’d end as a short term infatuation. The CEO just has an inner conflict which JinHyuk seems to fulfill, but how can she really mean so much to him? I am definitely more engrossed with CWPFN from the clips I’ve watched on IG. (So sad that I’ve yet to figure out a way to see a whole episode with eng sub here in US.) Still, Iove the laughs and vibe of CWPFN. I am also fangirling about YJ; how is it that girl can look good doing absolutely anything?! I’ve said it before but her acting just reminds me of a young Jin Ji-Hyuk with those comical yet pretty facial expressions. I also like how the CWPFN cast is comfortable with each other BTS. Now, I truly can see how they say YJ is a human vitamin. Even with an unlikely person, you can feel she can make good chemistry onscreen with anyone. I wonder now upon seeing how she interacts with other males, could we have been just blinded by her relations with BG. Is it possible she is just as nice with BG as any other man?? I pray not! I still have my hopes for this OTP. Soo wishing that YJ will also attend MAMA in Japan. Don’t know how much longer I can take it-I long to see them in one shot or even just attending the same event again would be super. P.S. @LynneL I want to know the story behind the 97 pencils. @kkwattana I thought BG’s drunk acting was one of the highlights of that episode. It makes him seem so young though, right? So sorry no chance of Yoojung as a cameo.... thats like trying to shoot the moon. Is it because they were so much highlighted during mdbc? Now nothing?? I didn't hear anyone cheering yoo jung while she was ill. However a little perplexed as to the sky high ratings. It’s definitely all due to having two sensational actors together and maybe a more popular ﻿network? I do agree star powers is really key in drawing crowds and both of them are seasoned, well established actors not to mention the noona is a veteran in the acting industry. And a plus with overseas filming. Well in MDBC, she was a cross-dressed enunch, hence have to dorn the same enunch (excuse my wrong spelling) outfit, hardly any chance to see her in female outfit except for that in the solo dance, meetup with Leeyeong at the garden, as a physician assistant (love her in that outfit) and the final scene where she could finally live her gender as Hong Raon. It’s likely a strategic move either between the two people involved or their agencies to downplay their connection. With their new dramas launching, naturally the professional focus is putting attention to their new work. It’s strange that they cannot openly support each other, but also a bit of a subtle hint itself (like Knowing Brothers has shown us) that there’s “something”. Honestly, the last thing they need to worry about are rumors or dare say, “scandals” much like the ending of the Episode2 Encounter. If there is indeed something btwn YJ and BG, it is special that they would like to protect it as part of their personal lives. A YJ cameo just seems like it wouldn’t fit in that kind of drama in my humble opinion. BG in CWPFN sounds more fitting BUT small network and big star-so no. I really believe the fact that these two are young it is good advice by their “bosses” to keep any signs of PDA (including public support of each other) out. Their careers are rocketing and comes first at this point of time. Going along with Encounters use of grapes as a metaphor for BG, he can get sweeter give it time. We just have to wait and see. I think once YJ is in her mid 20s and BG approaching 30 and done with his military obligation, it would become more appropriate /accepted for them to come out about any relationship. We can only delulu for now that these two are supporting each other in private. ps Wondering if maybe Min Do Hee (Gil Oh Sol’s BFF) might get some shout outs by BG or KDY? She’s our 6degrees of separation. pps Thanks @LynneL for your help! I look forward to watching. I am loving every moment of Encounter that until now I judge an artistic masterpiece, with two actors so good as to make me to forget that they before had been other characters...I'm not a fan of SHK, DOTS is certainly not one of my favorite drama, but I have to admit that in these first two episodes it won me over, it's an excellent actress and a beautiful woman, you can hardly notice the years of difference with her co-star... Their chemistry is daebak! 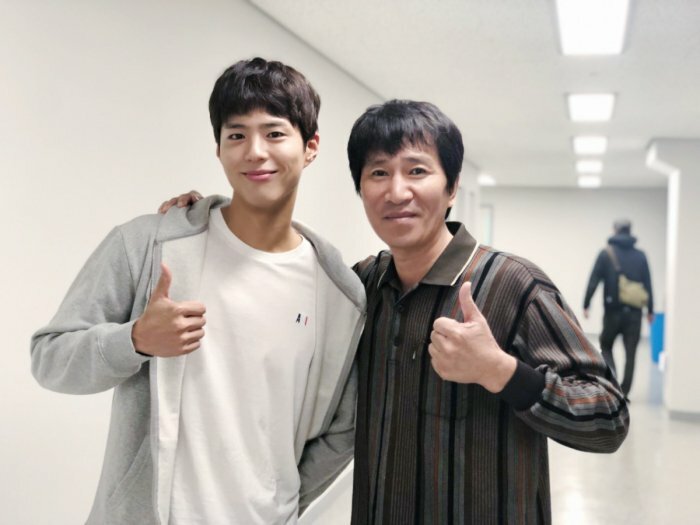 Both of them are really good depicting at thier role..Thumps up Bogum role is so genuine. Jin Hyuk and Soo Hyun have different lives, yet they met, knowed each other and feel attracted.. I think it's right don't tell too much of this drama as of CWPFN (that still unfortunately I'm not seeing in my Country), not to spoil the taste for those who have not yet seen an episode ... In the spoiler I have included some salient scenes, in which I think they have touched high-pitched acting ... Bogummy is just ... wonderful! Of course, a comparison between the two dramas is not possible, as I had already written, they are too different, same you can tell their characters... even a competition between them ( on who is better in acting) is not correct as well as nonsense... I am really satisfied about the ratings of both.. CWPFN surpassed almost all its direct competitors... and Encounter is picking many support and the critics are enthusiastic... I'm happy and I hope they are growing and leaving the mark... there will be other stories in the future and they, I'm sure, will meet again ... BoYoo fighting! Now, after this long introduction, I will be leave you soon some updates, even some old from a few days ago, I was really too busy to write, but not so much not to see Encounter episodes at least 3 times .. Happy sunday... and good start December! Well sorry Boju.....i am the one who said Encounter is draggy.... that is my personal opinion. I have already mentioned here that Bogum will be the sucess finale of 2018 and i am very happy for him because it seems that for 2019 he will be very busy with hosting and his Asia fan meet. I guess until June/July 2019 he is very busy with his fan meet. I am actually little bit sad as well as i feel that this is a sign that he will be enlisting soon. He might do one more project or none at all before he enlists.... so i am really glad that : Encounter is doing a fantastic job with the ratings and viewership. I love SHK from Full house and she has had up and downs like Yoojung and hence she is the older version of where i wish Yoojung would achieve in future. And i know this is BoYoo shipping but as always.... it is destined whatever is to happen will happen... it is all written out who will meet in our life and who is the one in the end. Bogum's time is now....he will achieve all success and Yoojung's time is coming. up until today I have expressed my support to the Boyoo couple (I have not written LeeRaon couple, but Boyoo couple because I have no doubt that our beloved guys are a real couple: regardless of all the signs, communicated by their songs, that they are still sending us, to confirm my conviction it is the fact that they do not publicly support each other: this is unnatural, because it's contrary to their kind nature and their declared and pleasant pleasure in acting together ... but also other facts, which in the previous pages have been treated by other friends, rooted me in this idea) allocating equal attention to the events that invested one and the other, without never delivering my thought to the words .... but today I am manifesting my humble thought. Why? the enthusiasm that arose in me for having finally seen the forum revived, through the intervention of many friends, has given way to the utmost despair when I learned the content of it. I do not deny that I felt lost, disconcerted and furious. I asked myself, but am I me in the wrong forum? Is it always the support forum for the Boyoo couple? I never thought to read a sort of opposition between her drama and his drama ... they are two dramas that are not opposable, not comparable, because they are very different: how can you compare a sweet dish with a spicy dish and decree the prevalence of one on the other? It is not possible because the choice belongs to the sphere of personal tastes. Even if one wanted to make a comparison within the same category or between two actors, the evaluation of pleasure or non-pleasure would be determined by one's own preference, by one's own personal taste. Nothing precludes expressing one's opinion, but if it is the bearer of one's own preference (produced by a personal taste ... by one's own sensibility), it would be advisable not to cross the limit of the caution of expressing it without opposing it to a possible comparison stone: doing it, you would risk to be misunderstood and, therefore, to annoy, to exacerbate the soul of those who do not share it. The effects of such a lightness in adopting the formula of communication of one's own thought could ignite outbreaks of tensions, damaging for the Boyoo couple: do not forget: long ago, due to a contoversial intervention by a fan of his new costar , our Yoo jung was forced to delete, on her instagram 1318, some photos and videos of her with Bo gum. My call to caution is dictated by the fear that our heart couple may be disturbed. And now, however, I need to scream out all my appreciation for the drama of Bo Gum. I'm not doing this because I'm trying to balance the opinions expressed here or to restore the rhythm of fairness that, I regret to point out, the contents of some comments, hosted on this page, have contributed to interrupt: it is assumed that those who are part of this forum enjoy the high ratings obtained by the drama of Bo Gum, without ifs and buts ... so without charging them to the fact that both have a large fan following: this reading is superficial and unjust. Bojoo, with extreme grace, has exposed and I'm sure will show more material that will confute it ... but if you read reviews and articles circulating on some instagram and twitter, already you would have a certain knowledge of how the drama of Bo Gum is intriguing, fascinating , moving ... talking ... so my scream of appreciation comes from the call of elegance, from the call of pauses, colors, shades, slow rhythms, accelerations, shots that crystallize memories ... feelings ... from the call of greyness, of overcoming, of youth, of maturity ... of interruptions ... of renunciations, of the weight of responsibility, of simplicity, of the ordinary, of normality ... of contrasts, of synthesis ... of leisure, of meetings, of timing ... simply of the motions of soul, of love and of life in its ordinariness and its magic. The skills of the director, the authors, the screenwriters lies in the fact that in just two episodes they managed to spread those calls within a just introduced love story, ... still to be developed and with a uncertain or unpredictable development; the two protagonists have got the undisputed merit of having made these variegated calls palpably alive, without falling into clichés. Only two episodes have been transmitted, that going me towards the discovery of two different sensitivities, aimed at living and loving each other, that have irremediably captured me. While the images of the landscapes, the environments, the different contexts flowed, while the dialogues alternated with the dialoguing silences, the shadows with the chiaroscuros and then with the defined outlines of the parable of life and love, my smile and tears alternated on my face: I let myself be crossed by the offered contrasts, that have awakened my emotional differences, prompting me to identify myself now in the simplicity and purity of his youth, now in the enchantment or fatality of an encounter experienced by both, now in the frailty of her, dressed in severity and professional efficiency. I never felt bored ... I just felt ... I felt emotion because it is a drama that deals with personal situations that can occur ... that occur in real life; it is not a drama unglued from reality. I find that the interpretation offered by SHK is naturally excellent. And what about our Bo Gum? He is enchantin! My dear @kKwattana, his interpretation of the drunk literally fascinated me: it has been so realistic and believable because it is crossed by absence, dizziness and euphoria, ingredients that he wisely and masterfully amalgamated, alternating them, while not stifling the background purity of his character. I add that the esteem that I have towards him has grown exponentially since he chose to play this character: try to play a normal guy (usually spectators are more likely to show sympathy towards a highly problematic character and with a dramatic past, made of suffering) is for him a actorial challenge not indifferent: he must succeed in making extraordinary and captivating what is ordinarily normal, but from those that are the premises, he is succeeding at great. I am convinced that Yoo, for whom love means respect and admiration, will not want to miss a single episode of Boyfriend, to admire her Bo and feel inspired by his skill. My dear @Kkwattana, Bo does not have to prove to bee as good at acting like Yoo, and the other way around , because both, with owen peculiarities, are great actors. So I think Boyfriend is: spectacular!!! I wait with trepidation that next Wednesday comes to be able to see another episode: I do not hide that these two episodes I have seen several times. I also really enjoyed the acting of Yoo, that I think she is a very good actress; I have seen both episodes of her drama, but just to avoid hasty and superficial evaluations and not to undermine or disregard the principle of caution, I will keep my opinions for myself. However, I wish both of our beloved Bo and Yoo to reach high peaks of listening and recognition with their respective dramas. It hurts me if my long comment has bumped the sensitivity of some friends, but do not forget that this is the forum dedicated to the BOYOO couple. Now on this forum, I will return to share information on our beloved Boyoo couple. I guess everyone is enjoying the dramas of Boyoo at the moment. I am and my mondays and tuesdays are filled with laughter and happiness. I hope yoo jung be special guest in one of his fan meet. ps: Like you, I found exhilarating the part of Bogummy drunk and I am glad it has received so much approval! For everyone, BoYoo is real!!! !